etch15mix - prepackaged 1650 series resupply kit for 210+ marks. (2) Etch30spray - Step #1 stencil activator spray - each 30mL. (1) Etch14st - Step #2 stencil cartridge - 3/4" wide 10 feet (304 cm) continuous length - Enough material for 40+ larger (3/4" wide x 3" long) or 80+ smaller (3/4" wide x 1.5" long) etching stencils. (2) Etch15st - Step #2 stencil cartridge - 1" wide 10 feet (304 cm) continuous length - Enough material for 40+ larger (1" wide x 3" long) or 80+ smaller (1" wide x 1.5" long) etching stencils. (2) Etch30cc - Step #3 permanent marking etch gel - each 30mL. 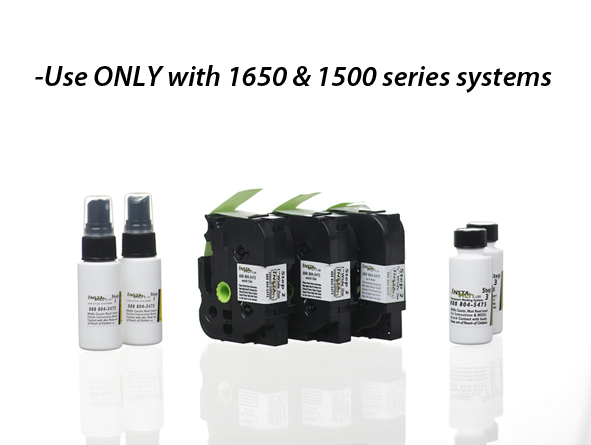 This prepackaged kit is ONLY for etch1650 & for etch1500 series professional kits. GLASS COMPANIES, handheld systems used in the field as a profitable add-on service. DEALERSHIPS, add VIN stencil printing to existing anti-theft program or even brand vehicles with your logo and phone #. MANUFACTURERS, scale-able systems easily integrate into production lines with one touch barcode scan & print. INTERNATIONAL, INSURANCE COMPANIES, BODY SHOPS and SERVICE COMPANIES!